Drums can mimic speech, issue battle orders, maintain rhythm in a jazz performance, or invite friends to gather. They can be made of natural or synthetic materials and take a form as simple as a hollowed-out log or as flashy as a glittery red snare in a 16-piece kit. The drum is one of the oldest communication tools. It was used for two-way communication long before the advent of the telephone and sends an immediate message to anybody who can hear it. For Indigenous people in present-day British Columbia, drums are more than communication tools and musical instruments; they are tools for a lifelong connection to and relationship with all living things and the Creator. Many drum teachings by First Nations in BC use the circle to represent balance and equality, wholeness and connection. The circle is unbroken and made of equal, connected, and infinite points. The Creator is the center, around which all living things—including humans, sit. Each animal, plant, and human is the same distance from this center and has a unique and direct connection to it. The drum voices our connection to all creation when we drum and strengthens our connection to each other when we drum together. 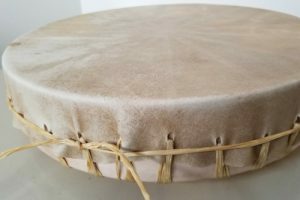 Circular drums are made by stretching an animal hide over a wooden frame that can be small enough to fit in a child’s hand or large enough to seat a six-member host drum at powwow. There are also different traditions. For example, the Tsimshian and Kwakwaka’wakw also make and play box drums, which are rectangular. Drums can be used at the beginning of an important meeting to pray for good work or at the end of an event to pray for safe travels home for attendants. There are songs for water-keepers and women; travelling and hunting. There are welcome songs that are played for the public and private songs that can only be sung by the owner. Drums are also meaningful in traditional in traditional Indigenous gift giving. How you receive your drum–whether you make it, buy it, or get it as a gift–is one of the things that gives your drum its unique voice in the world. 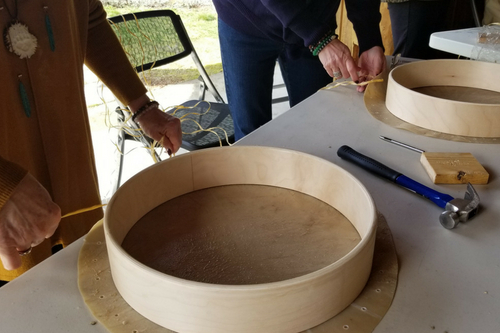 Drum making takes time, patience, and natural resources. It is a symbol of connection and relationship to all. Drums are often given as gifts in thanks for good work or to acknowledge an important relationship or time in someone’s life. 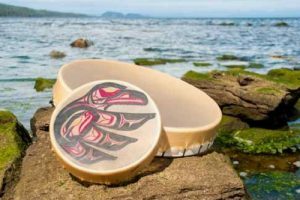 If you attend a workshop, consider that many First Nations cultures throughout British Columbia encourage learners to give away their first creation when new to a traditional craft. 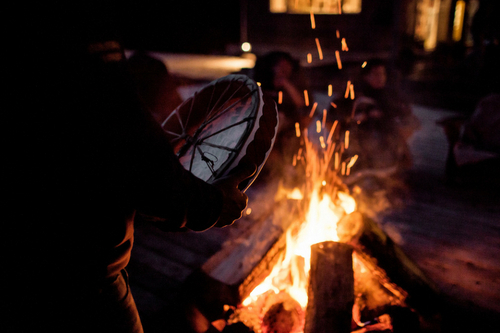 The sharing of traditional knowledge, including drumming and drum making, is done through the passing of teachings from knowledge keeper to learner. Drum making workshops last one to four days, depending on how much of the work has already been done for you. While drums can be left undecorated, most are adorned in a way that is significant to the maker and draws from the traditions and materials of the artist’s community. If you decide to make a drum, chances are the hide you will use has already been harvested, soaked, scraped, and tanned. You will still be able to smell the deer and the cedar as you transform them, with your own hands and creativity, into a drum. What is taught depends on who the teacher is; what is learned depends on who the learner is. The teachings of the drum never end.